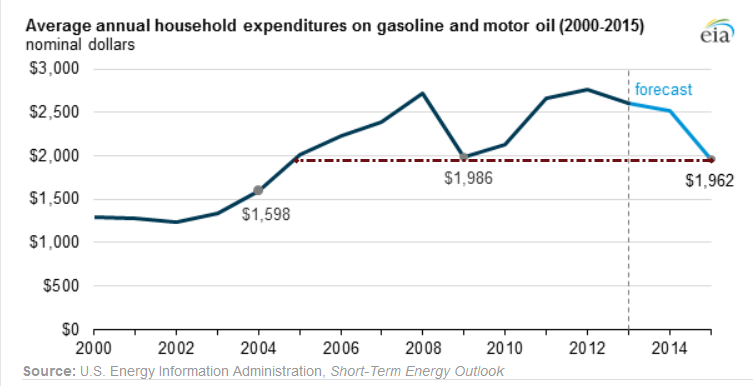 The US Energy Information Administration (EIA) forecasts U.S. Household Gasoline Expenditures in 2015 On Track to be the Lowest in 11 Years. The average U.S. household is expected to spend about $550 less on gasoline in 2015 compared with 2014, as annual motor fuel expenditures are on track to fall to their lowest level in 11 years. Lower fuel expenditures are attributable to a combination of falling retail gasoline prices and more fuel-efficient cars and trucks that reduce the number of gallons used to travel a given distance. Household gasoline costs are forecast to average $1,962 next year, assuming that EIA's price forecast, which is highly uncertain, is realized. Should the forecast be realized, motor fuel expenditures (gasoline and motor oil) in 2015 would be below $2,000 for the first time since 2009, according to EIA's December 2014 Short-Term Energy Outlook (STEO). The price for U.S. regular gasoline has fallen 11 weeks in a row to $2.55 per gallon as of December 15, down $1.16 per gallon from its 2014 peak in late April and the lowest price since October 2009. Gasoline prices are forecast to go even lower in 2015. Gasoline prices are falling because of lower crude oil prices, which account for about two-thirds of the price U.S. drivers pay for a gallon of gasoline. Increases in fuel economy are also contributing to lower motor fuel expenditures, as cars and trucks travel farther on a gallon of gasoline. According to the Environmental Protection Agency, the production-weighted fuel economy of cars has increased from 23.1 miles per gallon (mpg) for model-year (MY) 2005 cars to almost 28 mpg for MY2014, an increase of about 21%. Similarly, the fuel economy for trucks has increased 19%, from 16.9 mpg to 20.1 mpg in the same time frame. The expenditure forecast is not surprising given the drop in oil prices. 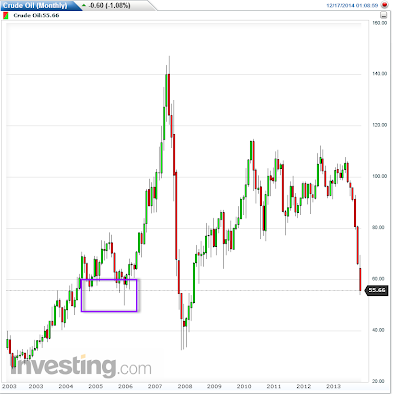 I commented on oil factors in What's Behind the Plunge in Oil? Winners and Losers? Boon to Spending or Recessionary? I give heaviest weight to number one, but they all cascade. Points 5 and 6 play out slowly over time. At some juncture, point 6 will reverse from being a drag on consumption to an expansion of consumption, but that could take a long time. Demographic attitudes take a long time to peak. Boon to Spending or Recessionary? Credit Suisse Group economists think cheaper oil will make "Fed tightening in the first half more likely." Is it that simple? I think not, siding with Early Slowdown Signs Emerge for U.S. Oil States After Crude Slide. After leading the U.S. economic recovery out of recession, some of the nation's top oil states are showing early signs of a slowdown as a result of the plunge in crude prices. In Houston, Texas, the first oil industry layoffs have been announced, with realtors there predicting a sharp decline, up to 12 percent, in home sales next year. Alaska's 2015 fiscal year budget revenue forecast will have to be lowered by almost $2 billion, according to Fitch Ratings, because of the sharp drop in the state's forecast crude prices. That will widen Alaska's budget gap to almost $3.4 billion, Fitch said in a Dec. 11 report. States such as Texas, North Dakota, Alaska, Oklahoma and New Mexico are all likely to feel strains next year, Wells Fargo Securities municipal analyst Roy Eappen said in a recent report. Meanwhile, household sentiment in Texas, Louisiana, Oklahoma and Arkansas where memories of the catastrophic 1980s oil crash are still fresh, weakened in October more than any other region, according to a report by Decision Analyst Inc. The Texas-based research company surveys monthly thousands of homeowners in the Census Bureau's nine regional divisions. The West South Central division, comprising those four states, had seen the strongest growth for four years, but in October survey lagged the rest of the nation, with economic gauges improving in six regions and two recording no change. The energy shakedown, currency volatility in numerous countries, a slowdown in China, numerous Eurozone problems, and bubbles in bonds and equities do not bode well for 2015.